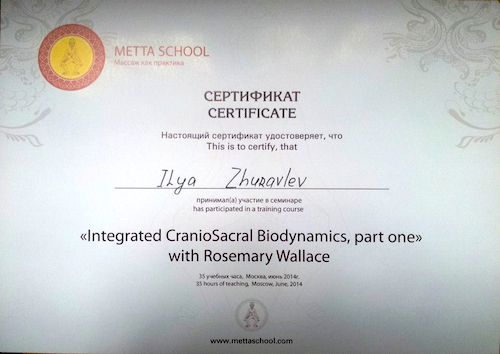 Since spring 2014 I do individual sessions of craniosacral therapy by method which I studied with teacher Rosemary Wallace — Integrated CranioSacral Biodynamics. The name of this therapy comes from the Latin terms cranium (the upper part of the skull) and sacrum. Sessions focused on the deep psycho-somatic relaxation (relaxation of body and mind) that allows the body and mind to «throw off» the accumulated tension and regenerate itself. 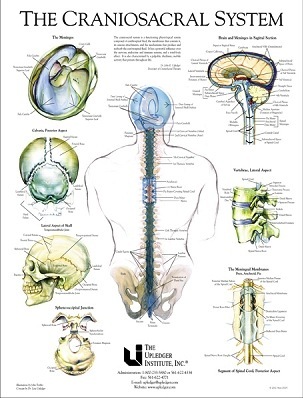 Technically, this is so — reciever lies in shavasana, and the therapist keeps his hands on certain areas of the body (feet, pelvis, thoracic spine, skull base etc. 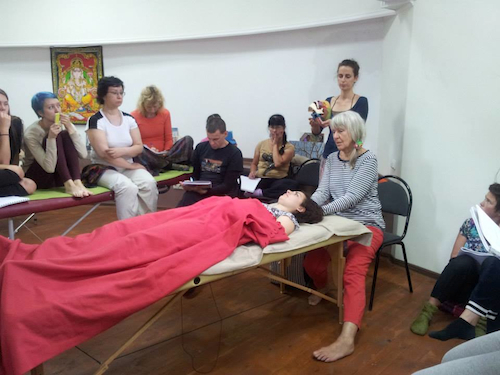 ), tracking craniosacral rhythm that gradually change their pattern, until it reach a state of harmony. Reciever at this time «flies into Space»:-) Usually a session lasts one hour. 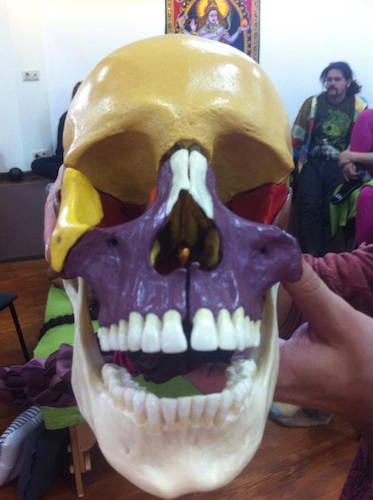 In March 2014, after the Bali Spirit Festival (quite a pop, by the way, the event) and my workshop in Kuta I got to craniosacral therapy session with a remarkable Russian physician Oleg Khudziev (who resides in Bali) — got seemingly spontaneously, Oleg was interested in past life regression (I`m past life regression theraist), and I decide to try craniosacral, which occasionally heard positive feedback from friends. The session made a strong impression, which I did not expect. Prior to that, from such practices, I tried several times to recieve Reiki from different masters, but felt absolutely nothing. Here I immediately felt that the body goes into a state of deep trance without any verbal guidance, just by «holding palms on» and begins by itself to recover from old injuries and relieving the hidden tension. I decided to learn more about this practice. 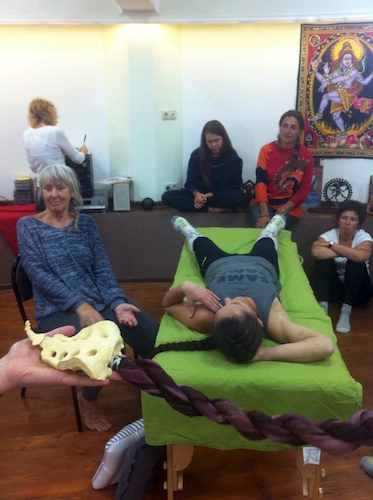 Soon during Yoga Rainbow Festival in Turkey our Thai Massage teacher Leila (Metta School) told me that they invited to Moscow an English craniosacral therapy teacher Rosemary Wallace, the course is five days with a full load, Rosemary teaches only in small groups, and only one spot remained. Puzzle formed. Rosemary looks like a merry old hippie, very attentive, feels and sees the problem and enslavement of the human body literally from the first minute. She is also tanato therapist (working with the dying, preparing their minds to move). She maybe about 70 years old, but she moves and speaks like 30 years younger. Information on her website is humble, though seems she studied all her life. She likes Acro Yoga, for which she was joking she criticized by her own children — say «undignified for the British lady in a certain age … » Schedule of her courses is made in a couple of years ahead. So I took this course, having received from the teacher, watching how I do a session, simple but valuable words to me: «You are doing good stuff». This has opened up new horizons in the study of working with the body and mind. How many amazing hidden mechanisms in the human being! Such knowledge gives taste and interest to live, learn the Universe and gives ability to help people. I am only at the very beginning of this journey, but the technique works great and is already giving practical results. Using a soft touch which is generally no greater than 5 grams – about the weight of a nickel – practitioners release restrictions in the soft tissues that surround the central nervous system. CST is increasingly used as a preventive health measure for its ability to bolster resistance to disease, and it»s effective for a wide range of medical problems associated with pain and dysfunction. Response to CST varies from individual to individual and condition to condition. Your response is uniquely your own and can»t be compared to anyone else»s — even those cases that may appear to be similar to your own. The number of sessions needed varies widely — from just one up to three or more a week over the course of several weeks. It was at this point that Dr. Upledger set out to scientifically confirm the existence of cranial bone motion. From 1975 to 1983 he served as clinical researcher and Professor of Biomechanics at Michigan State University, where he supervised a team of anatomists, physiologists, biophysicists and bioengineers in research and testing. The results not only confirmed Sutherland’s theory, but led to clarification of the mechanisms behind this motion — the craniosacral system. Dr. Upledger’s continued work in the field ultimately resulted in his development of CranioSacral Therapy. Rosemary Wallace has over 20 years of practicing and teaching a unique system of Integrated CranioSacral Biodynamics and her own method Gentle Touch. She began her studies at the Upledger Institute of Craniosacral therapy and Osteopathy, and accredited by the National Association of British healers.